He's a specialist in insurance fraud, and the finer points of human nature. He's insouciant, cynical, and glib�but honest when it counts. Wherever he goes, there's intrigue, excitement and mystery! 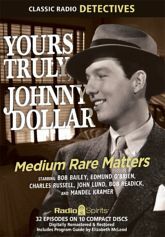 He's the Man With The Action Packed Expense Account: Yours Truly, Johnny Dollar. Charles Russell, Edmund O'Brien, John Lund, Bob Readick, Mandel Kramer, and the incomparable Bob Bailey star in these digitally restored and remastered adventures. This 32 episode collection includes four serials (two of which are missing a middle chapter).